It’s been a while since I last sat down and watched me a good ol’ Sci-Fi Original movie complete with commercials and stuff, though I can zoom through these commercials on my handy dandy DVR. Did you know that my DVR can tape four shows at the same time? Has there ever been an instance of anybody having four shows that they want to watch coming on the air at the same time? I’ve only used this DVR thing twice, the other time just to see if it worked so I don’t think that’s going to happen to me but if there are four shows that I want to watch coming on at the same time I’m ready. Anyway the movie that gave my DVR its workout today is the Sci-Fi Original ‘Star Runners’, which was many things… but original sure wasn’t one of them. number of movies like ‘Space Raiders’, ‘Alien 4’, ‘Serenity’… you name it. And when is James Kyson Lee going to get the opportunity actually to play a Korean? Anyway these cats get hemmed up by this local imperialistic government, think Star Wars, with the leader of the military unit of this government, one Colonel Bishop (Michael Culkin), giving our heroes an ultimatum. Retrieve a package for him or rot in jail. Bishop being a nod to ‘Alien’. This choice was an easy one so our heroes make the trip to grab this package and when things go wrong they are forced to open this package which reveals a beautiful defrosting naked woman inside. Think Fifth Element or Serenity again. Though this woman’s memory is fried right about now we will learn that her name Asta (Toni Trucks) and we will also learn that she has super powers, just like those chicks in The Fifth Element and Serenity. Unfortunately our heroes had their ship commandeered so now they have to take a space bus to drop off this package. Think ‘Speed’. It isn’t long before this bus is attacked in space battle with lots of space zooms and pans, ala Battlestar Galactica, with crack pilot Tycho taking over the controls of the bus and making a blind jump into uncharted space. Think 'Star Trek'. The ship crash lands on planet nowhere. That’s bad enough but this planet has the occasional human frying solar flare and is occupied by huge man eating bugs. I’ll let you guess that one. To make matters worse the ship that shot at the bus have followed them to this planet, the evil government operatives have followed them to this planet and the bugs are really hungry and really smart. I’m thinking it’s not often a boatload of humans crash on this planet which would explain our why these bugs are so damn happy that food has finally arrived. Now our heroes, Asta and a few of the bus survivors who are trapped on this planet, think ‘Gilligan’s Island’, must find a way to survive, learn the truth, and make it off this rock with one of the members of our trapped crew holding on to a deadly secret and who just might be a traitor. Think ‘Every Movie Ever Made’. 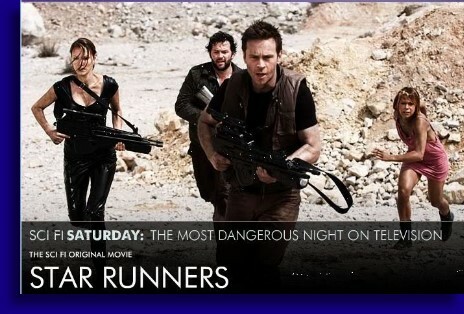 For a Sci-Fi Original ‘Star Runners’ wasn’t so bad. Actually, of the Sci-Fi Original movies that I have seen this one was one of the best. Admittedly this isn’t saying a helluva lot because this is the Sci-Fi Channel we’re talking and while ‘Star Runners’ is no ‘Minotaur’ or ‘Abominable’ but I would choose this over ‘S.S. Doom Trooper’ and ‘Raptor Island’ any day of the week. The fact that ‘Star Runners’ steals so liberally from other movies is one of the things that made it more entertaining than usual for me. You could actually base a drinking game or one of those DVD based board games off of this movie because it is kind of fun pointing out all the movies this movie rips off. In addition to these ‘plusses’ the movie does have its generous share of action, lots of bugs killing people, space battles, explosions, folks getting gored to death, dudes getting beheaded and Toni Trucks is really, really easy to look at. Now I am somewhat familiar with some of the work that Toni Trucks has done, a homegirl just up I-75 a little ways coming from Grand rapids, and as such I was just a little bit curious why they had this African American woman playing a blonde white girl, confirmed when we see young Asta via flashback as a child, being played by an authentic little blond white girl. I can only assume that there is a shortage of blond white women desiring to be actresses in Hollywood. That is damned tragic. Now if you take away the fun of naming the movies that this movie steals from and remove Toni Trucks running around in skimpy pink nightie held up by gravity alone then maybe the movie really isn’t so good, but you can’t take any of that way because it’s all in there. So while ‘Star Runners’ probably won’t make anybody’s list as a classic Sci-Fi type movie it does have its place, firmly secure, as some solid basic entertainment. And that’s saying a lot for a Sci-Fi Original Movie. I’m never using the term SYFY by the way. Never.